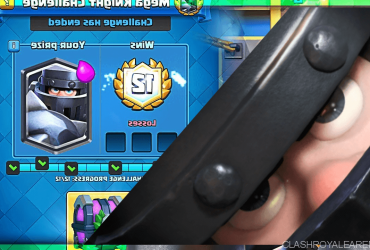 Hey guys Lolman here today bringing you guys a Night Witch deck guide. I am currently 24-0 with this deck that I use to farm 3 crowns with for clan chest. It’s a pretty solid Lava loon deck where I replaced the Elixir Collector with the Night Witch and she’s been working wonders for me as the 24-0 win streak suggests. Oh and ~ 18-20 of those were 3 crowns too so if you want to far 3 crowns really easily with a fun deck, try this out! Enough blabbing and onto the deck. Lava Hound- Main tank for the deck. It’s not quite advisable to start off with a Lava Hound on the back! Wait for opponent to make the first push. 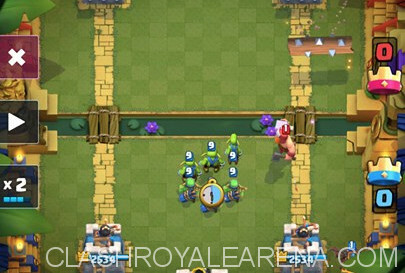 If your opponent place a tank at the back, use your Lava Hound the same lane. 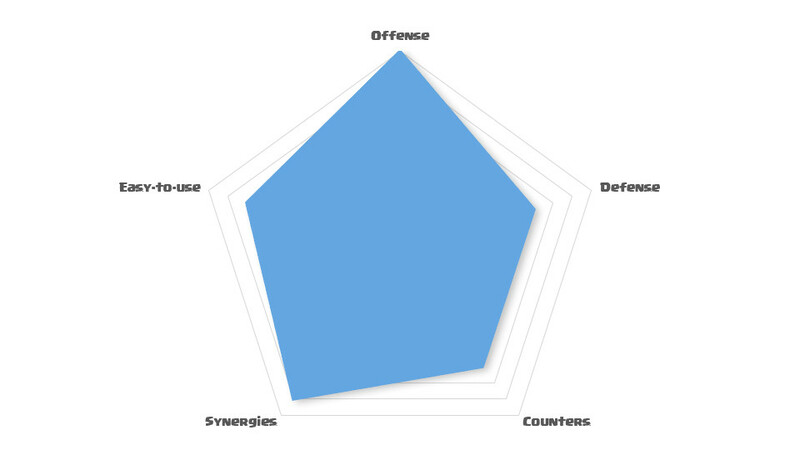 Unless it’s Golem, your tank is most likely going to be bigger than your opponent. Lava Hound itself is not intimidating but the Lava Pups are what are scary. If ignored, they can deal over 1900 damage to a tower but chances are they won’t dish this damage out… For example, don’t use Balloon behind it if they have Inferno Tower, instead try to get a value Lightning in and make opponents answer the Pups. You can argue that support behind Lava are also win cons, Night Witch as well but I think Night Witch is actually a win condition in this deck behind the Lava Hound. Ideally you want to play Balloon behind the Lava Hound but there are situations where you will rush your opponent. Here, I knew my opponent was almost broke to Rocket this push and I knew he was running 2.9 so I didn’t want him to have enough to Ice Spirit + Archers my loon so I included Goblin Gang in the push to draw out a lot. He’d not have enough Elixir to stop the Balloon, it worked. I was 4 Elixir up and got 1000+ damage on tower. Night Witch- This card is amazing. I initially thought she was rather underwhelming but the Bats behind the Lava Hound are intimidating. 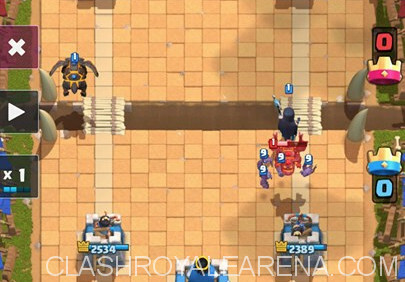 Behind a Lava Hound she will solo a Knight, Mini P.E.K.K.A etc. You won’t have a counter push to be worried about. On defense, she shines as a glass cannon, vs Hog and Royal Giant as well. Minions- Here as Lava support and Inferno counters. Also, they are good Graveyard counters since they don’t die to Poison in a tic. Great against Bowler, Valkyrie, Hog etc as well. In this case, Minions kept my friend here from placing Inferno otherwise he’d be 5 Elixir down to really defend the push. Either way, lost the tower and the king as well. Good thing of having 2 Minions is that this deck is air heavy and most decks have a lot of ground targeting troops, rendering them useless and they really just cycle these cards on defense while giving you value. For example, use Knight to tank for Musket will be killed by your Mega which sorta means your Mega Minion was placed *free of cost*. Similar to Minions, but he can kill support like Wizard, Baby Dragon, Executioner, Musket etc. He is basically a more versatile defensive card. 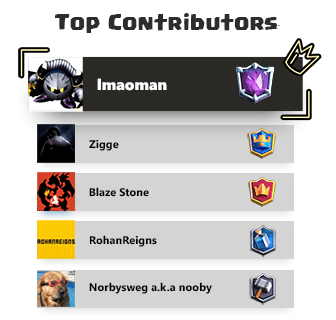 Also, he is a great support for the Lava Hound as well. He 1 shots Minions and Goblins as well so decent vs Goblin Barrel. Arrows- For Minions and Minion Horde. Vs spell bait, try to save this card for Minions or Minion Horde rather than Goblin Barrel. You have a lot of answers for Goblin Barrel in the deck so you can get creative how you handle this situation. 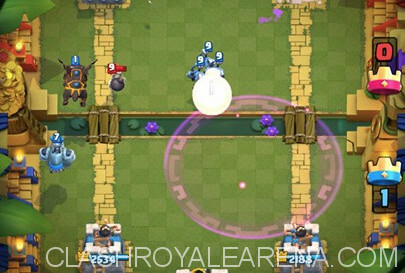 Though early on before you build up a push it is totally fine to use Arrows on a Barrel as you don’t want to lose a tower early on and have your opponent bottle up and defend completely. Lightning- Try and get value with this card! Inferno Tower is the ideal target. 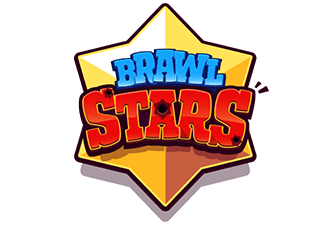 Lightning should be used on Elixir Collector and 3 Muskets as well. Just know when you have to hold onto this card and do not use it unless you can take a tower. In which case, it is worth the risk as you can usually cycle back to it if it is x2 Elixir time. Goblin Gang is mainly used for defense. It is also a great cycle card. Try and predict The Log placement with this card. Try and switch this placement up and use it wisely. Despite being squishy, this card counters Valk on defense pretty well. Try and get value with this card and its DPS. If the opponents don’t have Log in rotation, punish them by tossing this behind your Lava Hound. Here I ignored the opponents Knight and he Logged expecting it. He overcommited by Fireballing my Night Witch as well so I punished him with my Goblin Gang in front of the Night Witch. He’d have to waste Elixir sacrificing /cycling cards to get back to his Log. This goes to show how you should be ok taking damage if it means that you will end upbuilding up a bigger push. With beatdown, tower HP is a resource. I typically start off by cycling cards like Minions, Mega Minion, Goblin Gang in the back to get a feel for my opponent’s cards. Try to avoid starting with a Lava Hound in the back because you can be punished. In which case, depending on the push either spend the minimum Elixir you can to defend it mitigating damage and push to even or get ahead of damage. Or just go all in and take the trade. This is a 3 crowns deck. You have the advantage if 1-1 or 2-2. Try and let your opponent make the first move and then Lava Hound in the back. As Lava Hound approaches bridge, you can support it with a multitude of cards. I usually keep the Night Witch for defense and only counterpush with her rather than just smacking her behind the Lava Hound. 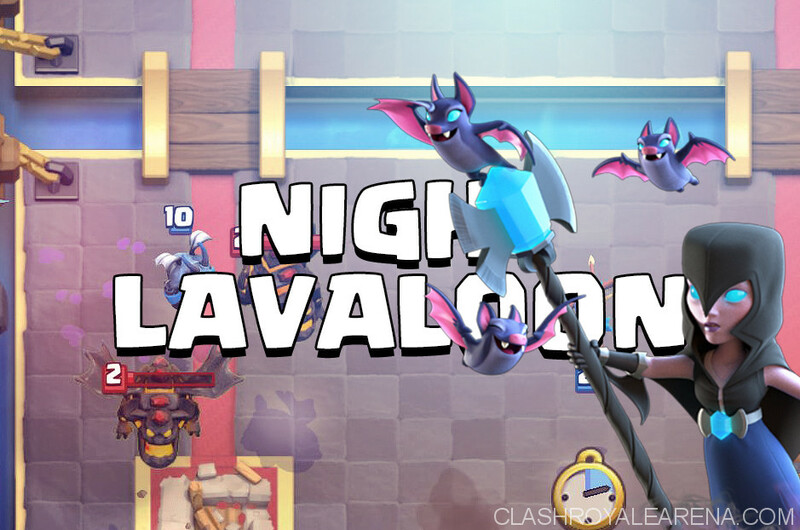 Support the Lava Hound with Minions or Mega Minion, try and avoid early Balloon plays unless you are sure the opponent has no Inferno Tower because you won’t have enough Elixir for Lightning 9/10 times in this situation. There are times I’ve just let my Lava Hound go and not support it at all just because I see Lightning value. For example, If the opponent uses Wizard and Mega Minion then rather than Balloon and suffer a counter push, Lightning to take care of 8 Elixir and have your opponent answer the Lava Hounds Pups. So, you really just have to get a feel for your opponent’s deck and figure out what cards you need in your pushes. Use Arrows if you see Minion Horde, use Lightning if you see Inferno etc. This is where you will end up doing a lot of damage by building up relatively big pushes with what you need to counter the opponent’s counters. For example, If your first push was killed by a Minion Horde because you Arrowed a Barrel, now you will answer Barrel with Minion, Mega or Goblin Gang while saving Arrows for the Horde in assistance of your push. If you Lightning’d an Elixir Collector and barely but was able to stop the 3 Musketeers. Then start your pushes with Lightning for the 3 Muskets, making positive trades can actually mitigate effect the Pump has in the game. Honestly, just Lava Hound in the back, Balloon, Mega, Minions, Lightning, Arrows. 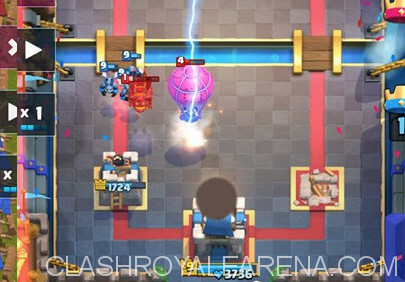 You will most likely have enough Elixir for spells like Lightning but don’t overdo it with support as the spells are far more important in most situations. You will succeed more if you only add supports when you have Elixir for the spell you need. For example, I don’t drop Balloon behind Lava in 1x Elixir unless I have enough for a Lightning. I will go with Mega Minion, that way I have 2 more Elixir than dropping the Balloon and will get Lightning up faster. Here, I knew I lost the tower as soon as my Lava went down so I focused on the push and ended up 3 crowning him in that first *counterpush* I made sure my Mega was behind my Lava Hound. E-barbs + gob barrel is 9 Elixir so technically I got paid 1 Elixir for my Lava Hound since I pretty much ignored the push. Not that hard of a deck to face. Just don’t let them take early towers as going 100% defense can easily stop you. Because Princess and Inferno Tower usually do work vs your Balloon. Don’t overcommit and prepare to do most your damage in 2x Elixir. Save Goblin Gang and Night Witch for Hog. I like to use Goblin Gang the first time vs the Hog Rider. Then, If I have a Lava in front I just Goblin Gang in front of Night Witch. Bats+ Goblin Gang + Night Witch destroy defensive Goblin Gang and Skeleton Army. Arrows the Princess and you should be good. I save the Arrows for Princess always, early on though best to Arrows the Barrel to not let opponent get too ahead in damage. And also try and push same lane so if rushed you build a bigger push. Night Witch is amazing vs tanks but try to use something to tank for her. Ideally you want to use Lava Hound on same lane while Night Witch taking care of the tank. With 2 Bats at level 1, she does 324 DPS. She spawns Bats in 5 seconds and by then with 4 Bats that’s 458 DPS which exceeds a P.E.K.K.A’s damage. She is reallly reallly deadly on the counter push. Just protect her at all costs as she has the same HP as a Bandit, which is not a lot of HP but makes her very solid in counterpushing. Also unlike Wizard etc. Fireball and Zap can’t kill her, however Fireball and Log will kill her for a -2 Elixir trade. Not a very hard match-up, you will take damage but Lightning is the key. Don’t put a whole lot behind your Lava if you are going against X-bow as you need Lightning for their Inferno + X-bow. Keep that in mind, don’t just spam troops behind it. It’s okay to take damage or even lose a tower. When you have tower up you will beat this! Inferno Tower is a lot weaker once a tower is down as the spots it can be placed safely is very small, in front of their tower and Lightning will make short work of it. Mortar as well, don’t stack troops together and give opponent Rocket value either. Don’t Lightning pump! Start pushing. Only troop that can really kill your push are 3 Musketers. You can Arrows away the Horde and save Lightning for the 3 Muskets. They will either place 3 Musketeers in center or behind the tower, both ways you can Lightning all 3 of them for a +3 trade. This is not a hard match-up at all. Just keep up the pressure and make positive trades vs them. You have Night Witch, Minions and Goblin Gang. Just try to place Goblin Gang so Spear Gobs are outside of Poison range so they sniper the Skeletons from afar. You will ideally use Mega Minion or Minions on the Balloon and Arrows for support. Try and make sure your Mega wins battle vs their Mega by using Minions to tank a few hits, that way Mega can turn to assist the Lava Hound or the Balloon. You can always use Lightning on defense. 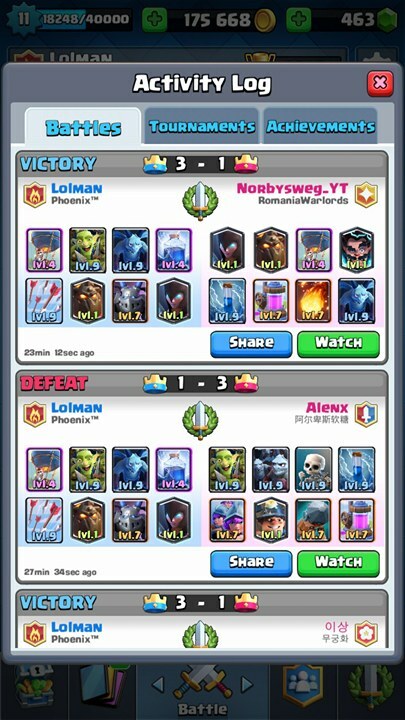 I got matched up with Norbyswegyt. A friend of mine who has been making guides for CRA also. He was playing a very similar variant of this deck which is cheaper and has an Elixir Collector. It’s slightly weaker to Inferno but works better vs decks like 3 Musket Battle Ram and in my opinion is slightly more versatile as Fireball is weaker than Lightning but it covers Lightning’s weaknesses, which is dealing with swarms. Night Witch by herself actually also shuts a Lava Hound down and a sole Balloon as well. Believe it or not. Combined Bats have some insane DPS. This deck is really solid and Night Witch is a great card. I think she will fit very well in the current meta in beatdown decks! Wish you guys all the best in using her and hope you find success using this deck. 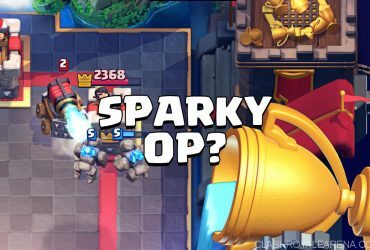 Is Sparky Really That Bad? 4,500 Trophies as a Level 8!